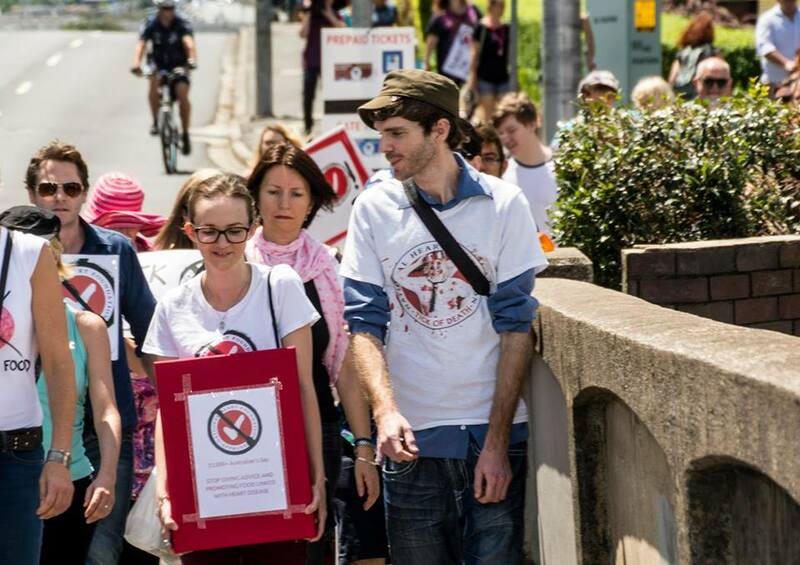 The Heart Foundation STILL NOT LISTENING. My Response. 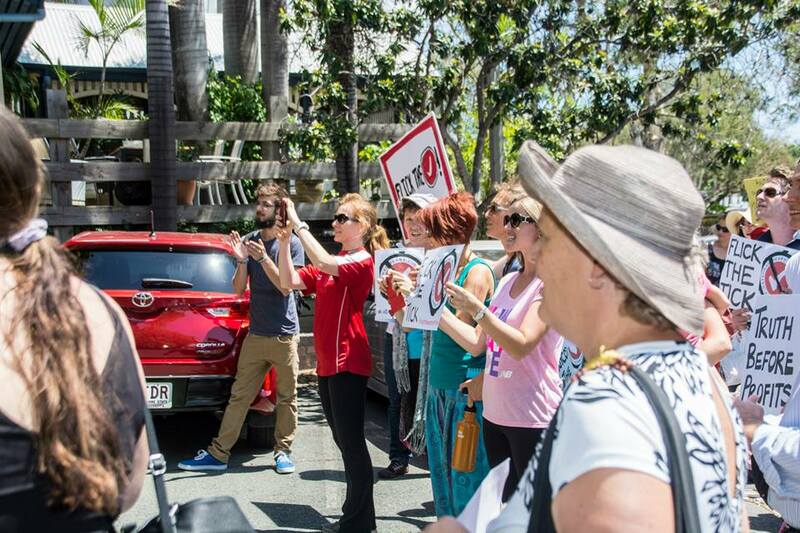 On Tuesday the 14th of October we rallied in Brisbane and delivered the 54,000+ signatures to Heart Foundation head office in Brisbane. I gave a speech and made some requests of the Heart Foundation. 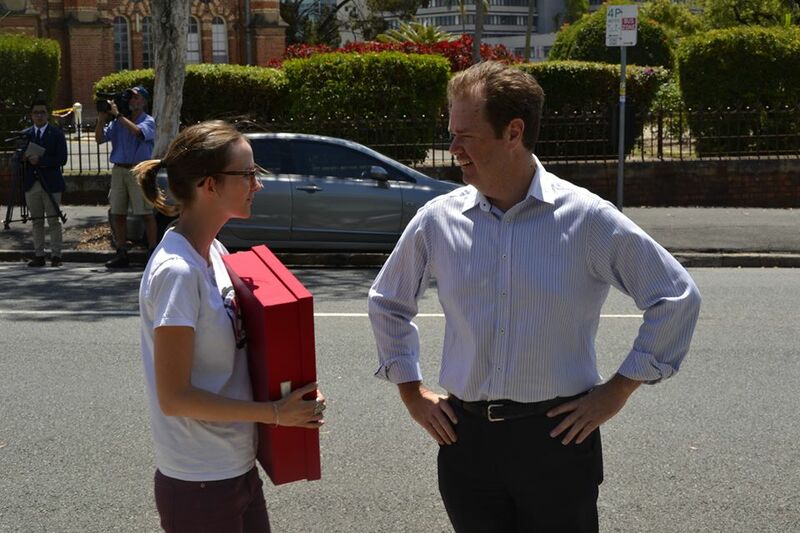 They didn’t answer my questions and sent out a young receptionist to simply take the box and walk back inside. Then they released this press release. They copped an absolute hammering for it on their facebook page (from which I am banned) and rightly so. As we continue to be ignored and our requests and petition belittled. You can also read the Health Minister’s response here. Abysmal. This is the press release broken down and my response. 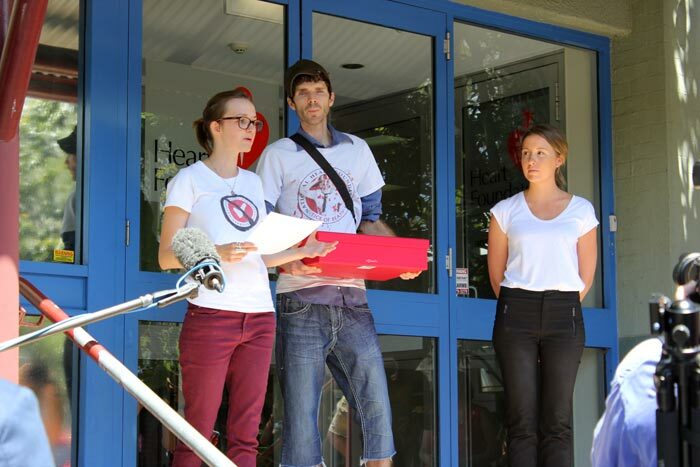 “The Heart Foundation received a petition from Jessie Reimers at our Brisbane office, today. We have already announced a review of our Tick Program, which this year clocked up 25 years as Australia’s first packaged food labelling program. Our review, which began in June this year, includes a public consultation, in which the public can complete an online survey via our website www.heartfoundation.org.au/TickReview . 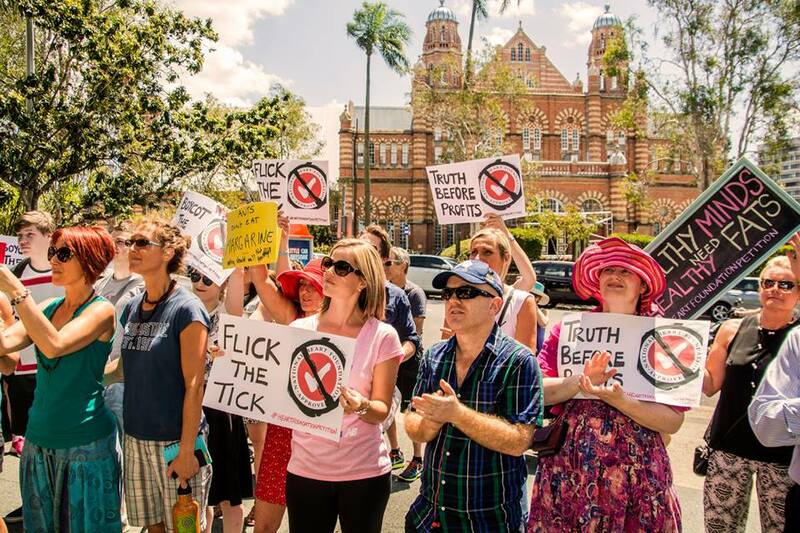 The petition will be incorporated into the Tick Review process and considered amongst feedback from a variety of organisations and people. 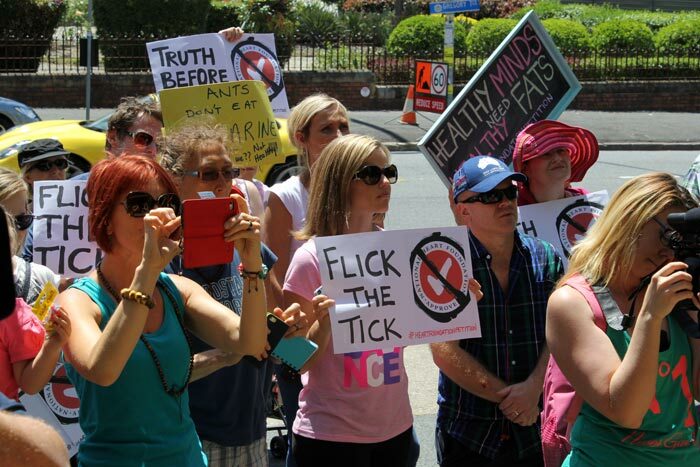 The Tick Review, conducted by external experts with public health, nutrition, business and food industry credentials, will be completed in 2015 and will look at how the Tick program might best work with or complement the Federal Government’s Health Star Rating system. Great. A review by the end of next year. We have filled in your survey. We understand that the review will include “An external group of experts with public health, nutrition, business and food industry credentials.” PRECISELY WHAT WE DO NOT WANT. 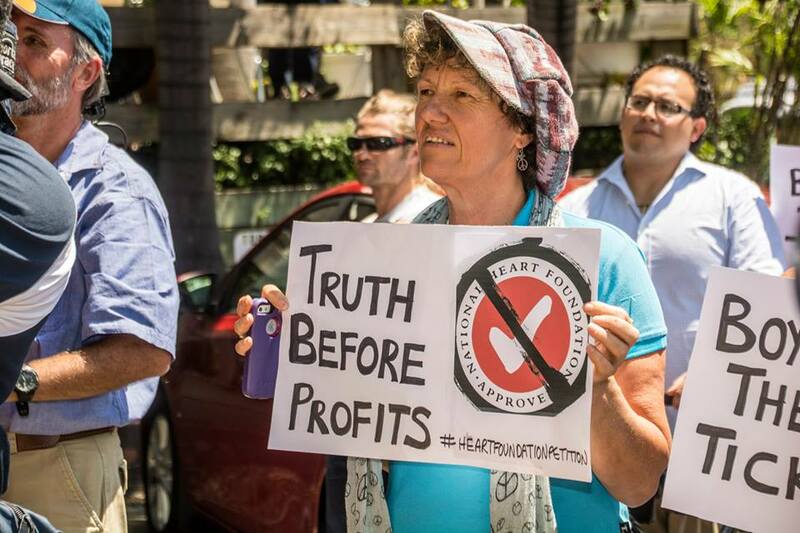 We want transparency and a move as far away as possible from the Processed Food Industry. Also this does not address our concerns surrounding your Nutrition Guidelines and does not get the Heart Foundation off the hook. It is merely PR spin to make people feel like they are being listened to- just for another rubbish program masquerading processed foods as ‘healthier choices’ to come in so money can exchange hands. Not. Good. Enough. With regard to our dietary guidelines, these are based on solid evidence and are in line with the World Health Organisation, the Australian Government’s endorsed National Health and Medical Research Council Australian Dietary Guidelines that were released in 2013 after reviewing 55,000 papers, Cochrane Reviews and countless other reputable organisations. Even the Australian Dietary Guidelines, as flawed as they may be, call for limiting added sugar, although what I do find interesting is that they only talk about added sugar in sweetened beverages, the mention of added sugar in things like cereals is given a WIDE berth, I wonder why that would be???? Big Cereal giving you shut up and promote our rubbish money again? I just found this hilarious tv advertisement sponsored by the Heart Foundation which depicts a man drinking a glass of FAT because of all the SUGAR in soft drink. That’s interesting, so sugar is a problem in soft drink but not in the Heart Foundation Tick Approved 99% fat free mayonnaise which actually contains MORE SUGAR THAN A CAN OF COKE. kdafhskdhfsjkahfgkajshdkkslflasjdgkag. Oh sorry. Just had to casually bash my head into my keyboard a few times. Don’t worry about Milo Cereal either, it’s only got 27% refined sugar, but it’s in CEREAL, not soft drink, so it must be sweet. You. Have. Got. To. Be. Kidding. I also love how the add ends in a casual promotion of skim milk. What an absolute joke. You know what’s funny? Skim milk also generally contains added sugar or artificial sweeteners because when you remove the fat from something it generally tastes rank so then something needs to be added to make up for it. EVEN MORE HILARIOUS (well it would be, if it wasn’t literally contributing to death)- skim milk is LINKED WITH HEART DISEASE. Is it just me or are the Heart Foundation trying to actually create wide spread heart disease and illness? It seems like nearly everything they advise and promote is linked with heart disease and inflammation, truly scary. “A note on the production of skim milk powder: liquid milk is forced through a tiny hole at high pressure, and then blown out into the air. This causes a lot of nitrates to form and the cholesterol in the milk is oxidized. Those of you who are familiar with my work know that cholesterol is your best friend; you don’t have to worry about natural cholesterol in your food; however, you do not want to eat oxidized cholesterol. Oxidized cholesterol contributes to the buildup of plaque in the arteries, to atherosclerosis. So when you drink reduced-fat milk thinking that it will help you avoid heart disease, you are actually consuming oxidized cholesterol, which initiates the process of heart disease.” Healthy, Home Economist. 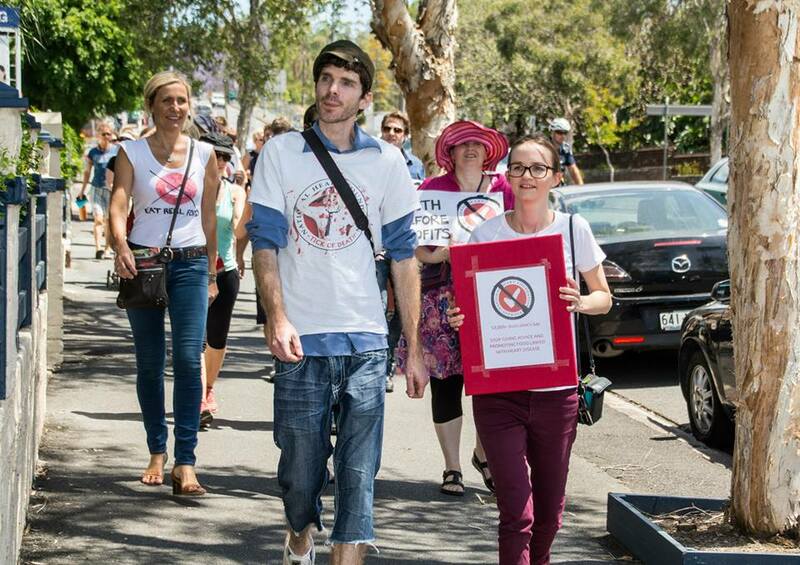 When I was on 4bc radio the other day talking about the Heart Foundation Petition and my concerns, feel free to follow the link and listen in. Ms Barry the CEO of the Heart Foundation came on after me, didn’t respond to any of my concerns- especially about margarine and seed oils and then went on to promote things like skim milk saying that it is a good source of Calcium- we are all told we have to consume dairy products to protect our bones and take rubbish like Caltrate but did you know the more dairy you consume the MORE LIKELY you are to suffer fractures? Consuming too much dairy actually STRIPS calcium from our bones and in the form of a supplement is even worse, being linked with heart disease. Ms Barry also said that it was a good source of Vitamin A & D – definitely not the case if drinking skim or on the very low fat diet recommended by the Heart Foundation as these vitamins are FAT SOLUBLE and will need to be consumed WITH THE FAT in order to be utilised by the body. She also alluded to skim milk being a good source of fibre- the most ridiculous statement to date. There is no fibre in skim milk. Period. “The NHMRC (National Health and Medical Research Council) recently reviewed all available evidence to update the Australian dietary guidelines and concluded that sugar as an individual nutrient was only important in relation to dental caries. I love how they say consensus, rather than evidence. Like THIS STUDY. The Heart Foundation are well and truly in bed with big sugar. This is not an uncommon problem. This article outlines the case nicely. This was when the World Health Organisation were attempting to HALVE sugar consumption recommendations. “The draft proposal follows a study of tooth decay. It comes after claims that sugar may play a key role in rising obesity and heart disease, which is strongly disputed by the food industry. “It is political dynamite,” said Philip James, president of the WHO-affiliated International Association for the Study of Obesity. Shrinath Reddy, a cardiologist and a member of the WHO panel of experts, said he supported the reduction despite not attending the meeting where the proposal had been discussed. “I would agree with the recommendation to reduce it to 5 per cent,” he said. The Nutrition Guidance Expert Advisory Group (NUGAG), a specialist nutrition review committee, was set up three years ago to reassess the 10 per cent limit, which was set in 2003. NUGAG had concluded at a meeting in March that 10 per cent was still valid with regard to obesity. It is understood, however, that after reviewing a study on dental health the panel agreed that sugar intake should be reduced to 5 per cent. There are concerns among some experts that the draft recommendation has still not been published. The sugar industry had threatened to lobby for America to cut pounds 260m of funding to WHO when its experts had recommended cutting sugar consumption to 10 per cent in 2003. A spokesman for WHO said that the draft recommendations on sugar intake were still being finalised and the process was “taking more time than anticipated”. HELLLOOOOOOO IS ANYONE READING THIS??? This is the kind of blatant corruption we are dealing with. It is an absolute disgrace. These establishments are an embarrassment and blight on the medical and scientific community. The real health professionals and researchers who strive for truth and integrity have been muddied with this kind of disgraceful behaviour. It is sickening and it is quite literally killing people. They should be locked up! 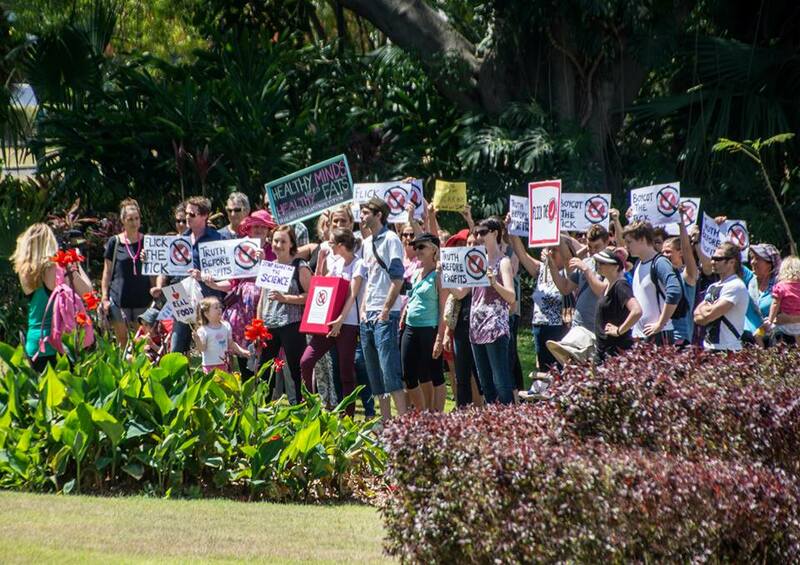 While we recognise that issues of health and nutrition can ignite passionate debate, we must be clear that we change our dietary guidelines based on good quality, consistent, peer reviewed evidence and nothing else. No. They aren’t. They are based on what the Food Industry wants us to hear plus whatever your Pharmaceutical-conflict of interest- round table tell you to say. Yep I’m aware these are big claims. But seriously. Take a look at yourselves. 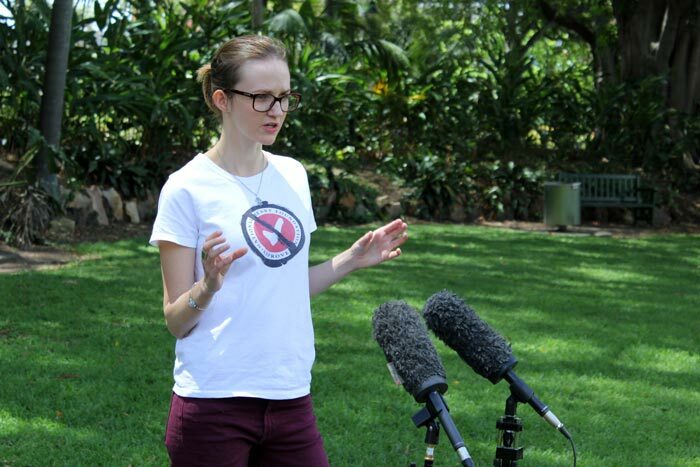 It’s not just some 24 year old bogan from Brisbane with a bit of a law degree and a partial qualification in Nutrition who started the petition to stop you propagating advice and promoting food that literally CAUSES heart disease on your case. 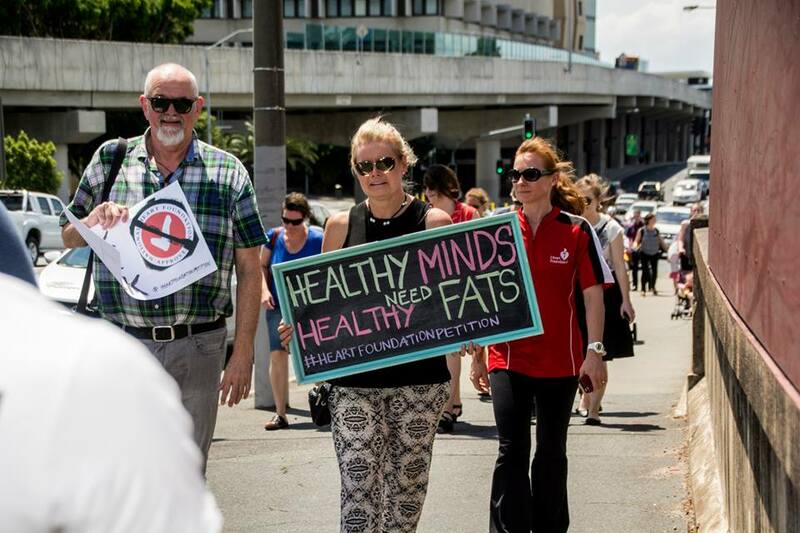 Qualified Dietitians are breaking ranks to support this. 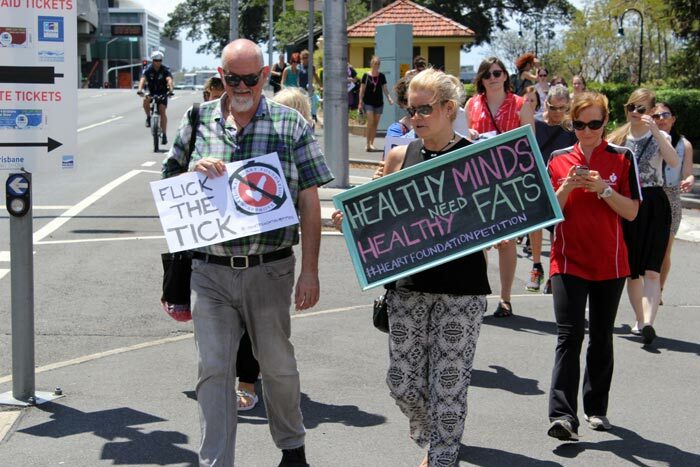 Chef Pete Evans, who is also publicly supporting the petition shared a brilliant post by qualified Dietitian Joe Leech the other day. “Now I’m not sure where they are getting their “existing levels of evidence” from, but all the new research CLEARLY shows sugar has a direct impact on disease. And not just type 2 diabetes, but heart disease and obesity too (they’re all related). Can we really still say that added sugar doesn’t warrant at least SOME restrictions? That’s what the Heart Foundation are saying with their Tick criteria. 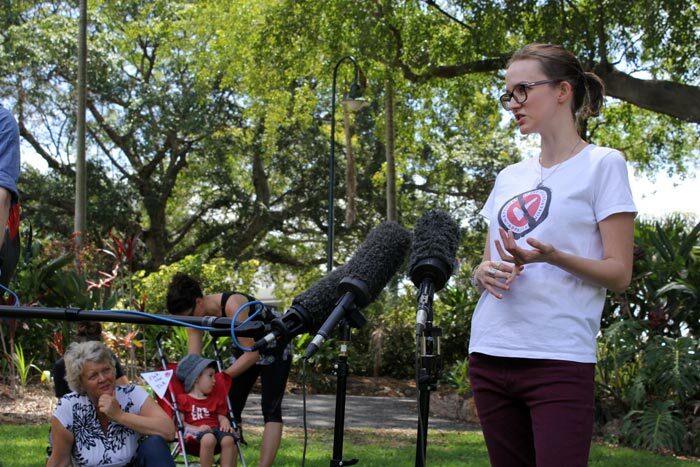 And yes I have cited observational studies – “observation does not equal causation” – but it is telling data that cannot simply be ignored, like the Heart Foundation is doing. For those playing at home, there have also been animal studies looking at causation (clinical trials). There’s PLENTY more studies but space in this post is just too limited. 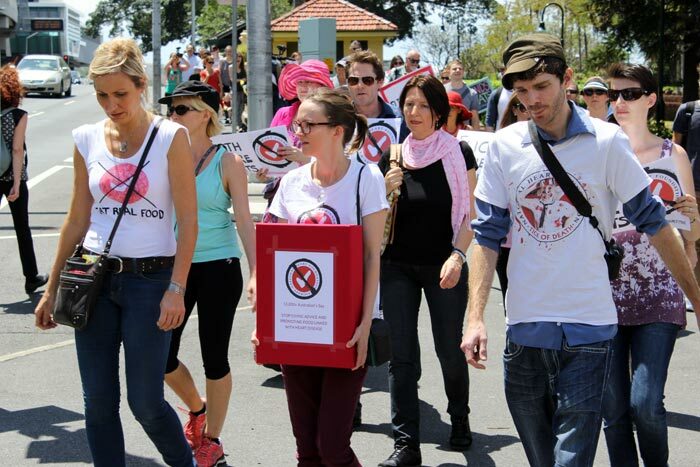 You get the point though, there’s no shortage of new research- why are the Heart Foundation ignoring it? 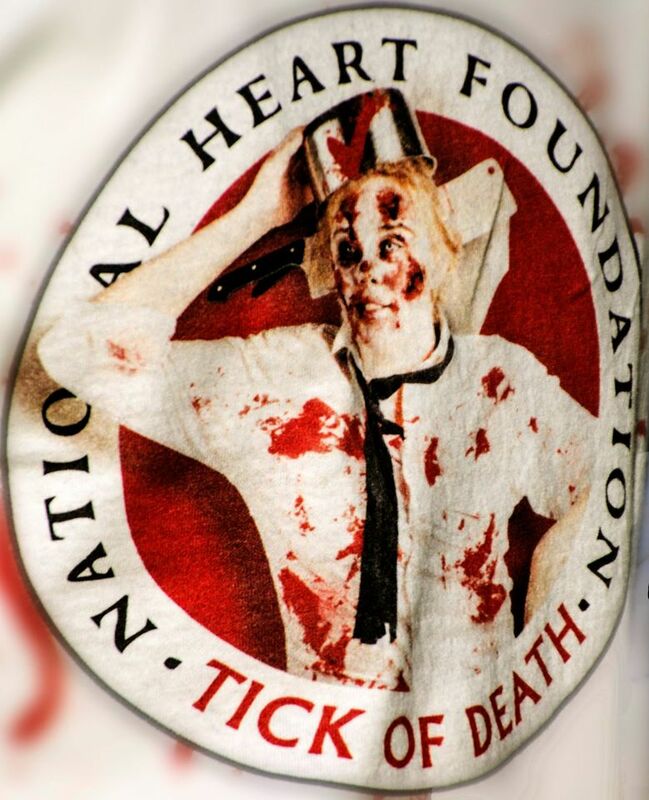 So just what evidence do the Heart Foundation base their Tick recommendations on? This is the part where it GETS REALLY INTERESTING. Again HOW ARE THEY GETTING AWAY WITH THIS??????!!!! SERIOUSLY??!!!! There is enough evidence to mount for a class action. And we are still only talking about sugar. Sweet Jesus. Literally. 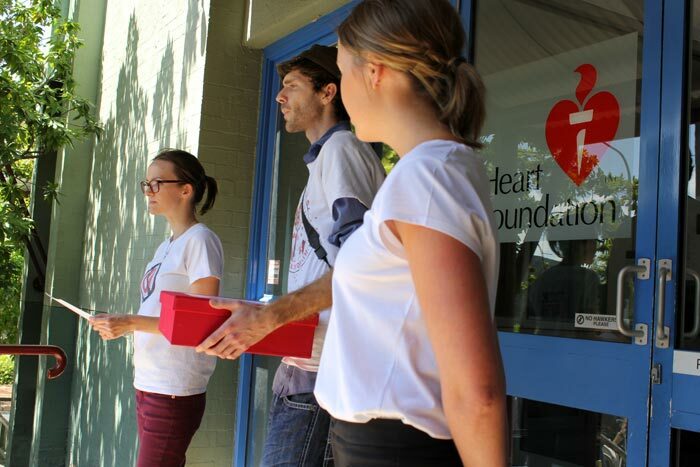 The Heart Foundation continually monitors and reviews emerging evidence as it is published and seeks external expert input and assessment in relation to our current position. 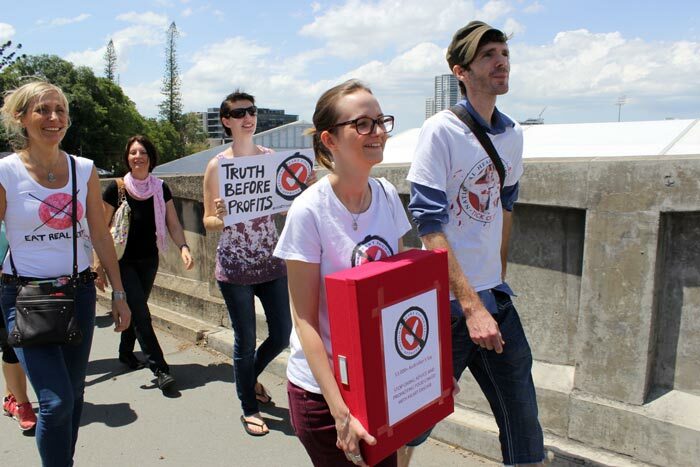 The Heart Foundation bases its recommendations on the vast body of evidence, not individual papers. To date there has not been good quality peer reviewed evidence to warrant a change. The lovely Sarah from Homemade, Healthy, Happy has helped us out with this brilliant post she did today on the Heart Foundation’s ‘current evidence’ you can read it here. Someone riddle me this. 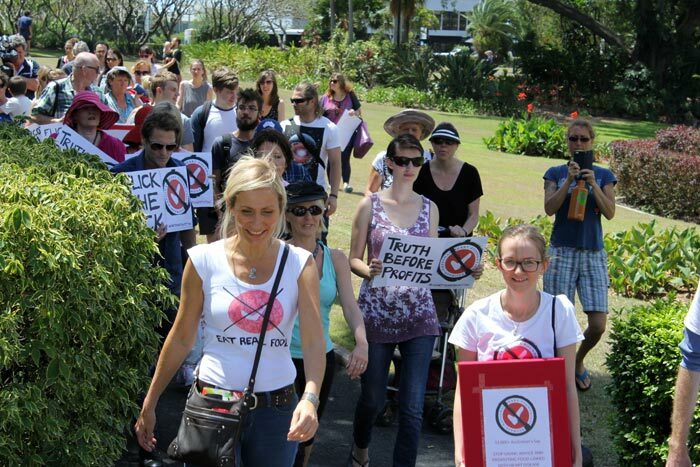 Why are the Heart Foundation WAITING FOR PEER REVIEWED EVIDENCE TO WARRANT CHANGE????? Shouldn’t they be, as a charity that raises millions of dollars from the public, actually leading the charge and creating some goddamn studies themselves? Where does all this money actually go?? In improving surgery for all the heart disease they are causing? I would like the CEO of the Heart Foundation Ms Barry to sit down and spend two hours watching this lecture. Then I would like to ask her how she sleeps at night fronting a charity that knowingly spouts misinformation linked with heart disease. Some of these studies are in the petition but continue to be ignored so I will REPEAT. Here is an example of evidence to suggest that saturated fat is not linked with heart disease. This is a MASSIVE meta-analysis involving over 340,000 subjects. http://ajcn.nutrition.org/content/91/3/535. You will literally find a BOATLOAD more studies debunking the outdated saturated fat and cholesterol hypothesis here. I am sick to bloody death of this peer reviewed study nonsense anyway. Seriously. Even randomised clinical controlled studies are also becoming more and more difficult to trust. Prathap Tharyan explains this brilliantly in an article published in the Indian Journal of Medical Ethics. “Empirical research indicates that much of the evidence required for the practice of evidence-based medicine cannot be trusted. The research agenda has been hijacked by those with vested interests within industry and academia, determining what research is funded and how it is done and reported. Unnecessary, inappropriate, or poorly designed and reported research results in suboptimal health outcomes. Many well-reported randomized controlled trials are designed to deceive by their choice of comparators and outcomes, and manipulation of statistics to produce desired outcomes that are selectively reported. 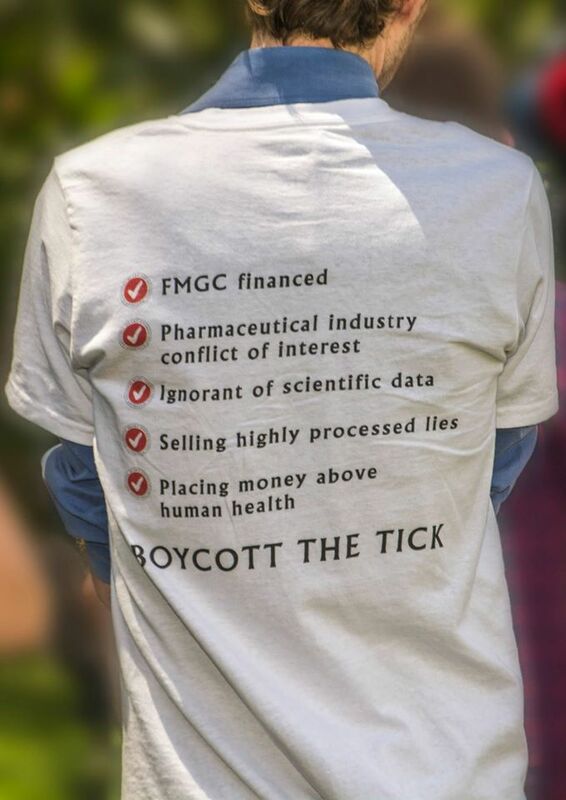 Undisclosed conflict of interest, ghostwriting, the manufacturing of disease to increase drug marketing, and the marketing of research disguised as education are common. NAILED IT ON THE HEAD THERE MY FRIEND. Another brilliant place the Heart Foundation and all of the other health authorities spouting misinformation might like to start is this article . The advice to replace traditional, NOURISHING saturated fats with margarine and vegetable/seed oils like GM Canola is an absolute abomination on public health. Numerous studies linked here and here. Seriously take a moment to watch how Canola Oil is actually made. If you want the Heart Foundation to STOP PROMOTING FOOD AND GIVING ADVICE LINKED WITH HEART DISEASE PLEASE SIGN THE PETITION!!! We will not be ignored. We the people want change and we want it now. Go to the Heart Foundation facebook page and tell them what you think. Keep the pressure on. We must unite together to make change and protect our children but also ESPECIALLY the elderly and vulnerable who take these clowns and this advice seriously. It is absolutely devastating their health. PS watch this documentary to understand the scam that are Statins (cholesterol lowering drugs). 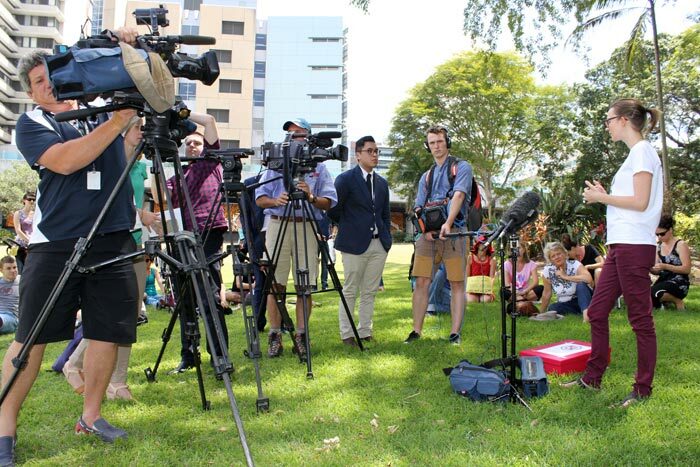 To read more about our announcement to review the Tick Program – read our media release here. 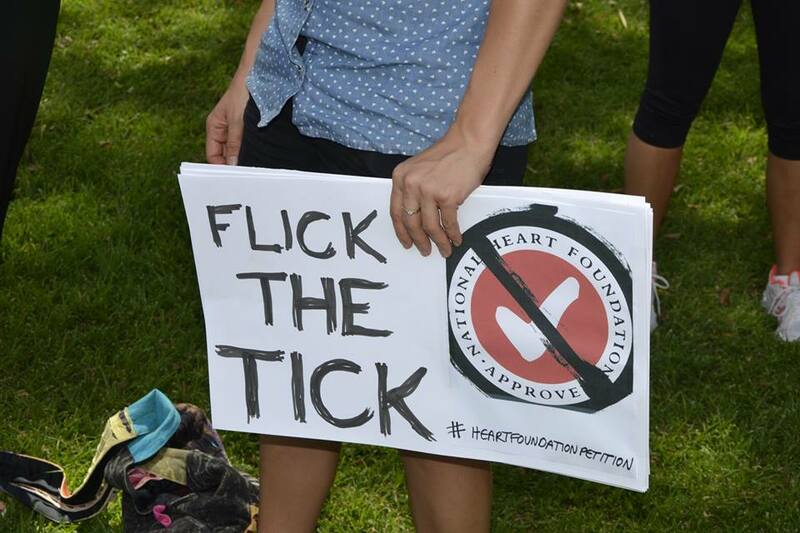 Or visit our webpage www.heartfoundation.org.au/TickReview <<take the survey. The Heart Foundation continue to state that they base their advice on good quality scientific evidence and NOTHING ELSE. My food friend and Qualified NUTRITIONIST Dinielle Farquharson from Forever Nutrition did some digging on this and a brilliant blog post outlining SOME of the conflict of interests involved. Of course there is no conflict of interest here! • Marketing Manager at Goodman Fielder -Goodman Fielder is Australasia’s leading listed food company. The company has an excellent portfolio of well known consumer brands in some of Australia’s and New Zealand’s largest grocery categories, including MeadowLea, Praise, White Wings, Pampas, Mighty Soft, Helga’s, Wonder White, Vogel’s (under licence), Meadow Fresh and Irvines. Our products cover every meal, including breakfast, lunch, dinner and snacks. We produce bread, milk, margarine, flour, dressings, condiments, mayonnaise, frozen pastry, cake mix, pies, savouries, smallgoods, chilled and frozen pizza, desserts, sauces, vinegar and cooking oils. 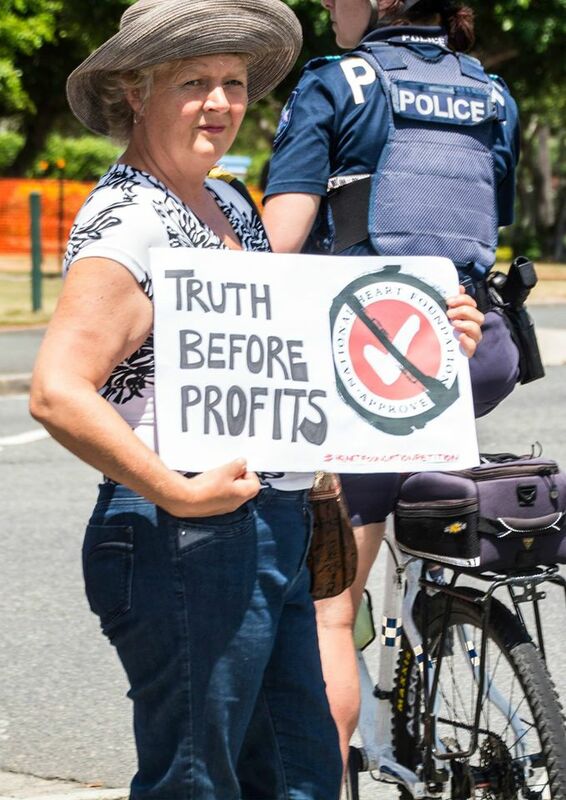 • The DAA (Dieticians association Australia) They follow the heart foundation/govt dietary guidelines have corporate partnerships with brands such as Arnotts, Kellogs, Nestle, Dairy Australia, Unilever, Jalna –more conflict of interest? Yes we better keep all those guys happy! They give us money…mwah ha ha ha! • Polyunsaturated oils were never found in nature, we used lard, ghee, butter, tallow, coconut oil, cold pressed fruit oils (avocado, olive) Obesity, diabetes and heart disease was very rare 100 year or so ago. • France eats the most saturated fat and has the lowest rate of heart disease deaths in all of Europe. • 45% of the fatty acids in breast milk are saturated and contain 15mg of cholesterol per 100ml of breast milk- obviously very important for growth and development. PS. Sign the petition. Seriously. Very powerful Jessie! Just wish they had the guts to admit what they are doing. Keep up the great work! 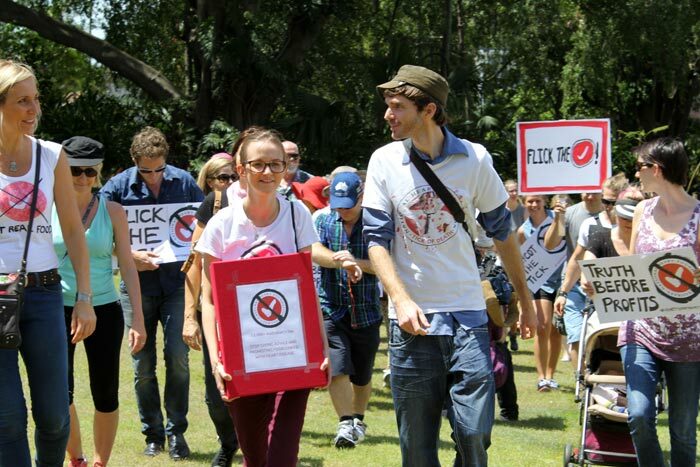 Keep up the fight Jessie!! Hopefully this might give you, Jessie, and your readers a small but accurate insight into what the Heart Foundation tick program promotes and represents. You’re welcome. I am a little unsure of why my comment from yesterday was removed. 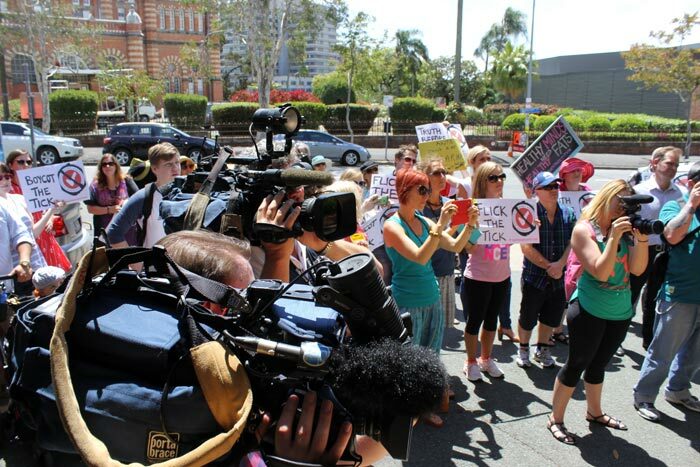 Just as you are Jessie, I am exercising my right as an Australian citizen to my freedom of speech. 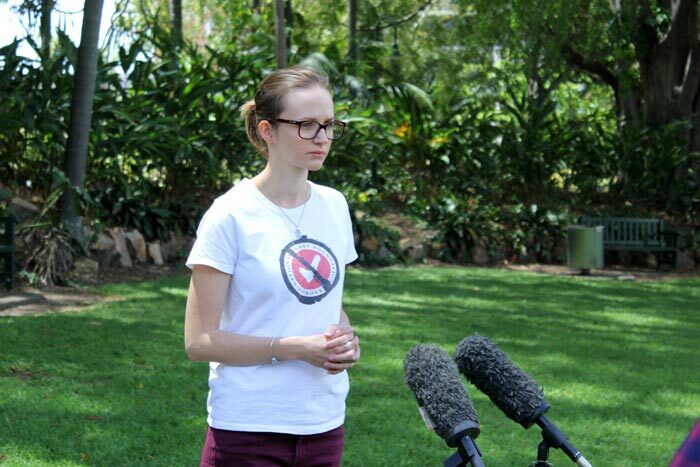 I kindly request that you to allow me to provide yourself and your readers with a small insight (again) into what the Heart Foundation promotes as an organisation; advocating for the betterment of heart health amongst the Australian population. Thank you. It wasn’t removed I just hadn’t had a chance to approve it yet. Been catching up on some me and family time.